The vanilla sponge based cake is a visual and gulping delight for the party lovers. Filled with creamy vanilla this dessert will give you all the eating pleasures of the world. The fresh and juicy fruit toppings make it more ineludible. 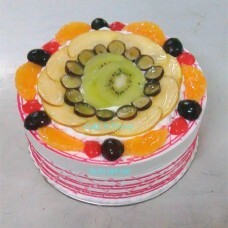 It is perfect to celebrate a birthday or anniversary to share the love.